Scan of ORIGINAL CALLBOOK is under the following translation. current document is for public information. 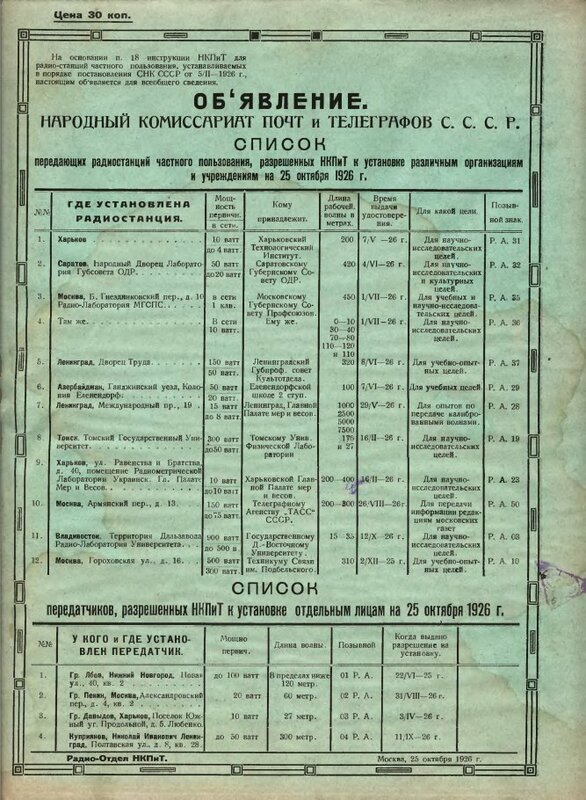 People's Commissariat of Posts and Telegraphs U.S.S.R. I think that finding such history is always moving - because it becomes a link into the lives past. Just found your comment, Tomas. Yes, I confirm, it's a good point, but there is another, less important than that purpose thing - there is a some information about power, operating frequencies and equipment of early Soviet HAM radio stations. For what? Don't know, maybe for reconstructions, QRP experiments, memorial stations - for any kind of historical HAM setups, which can be made in present days.